Today I was going to celebrate the coincidence of my birthday falling on the same day as the New York Daily News was scheduled to feature a story about my blog. Well, there must have been some bigger breaking news (Brangelina changing a diaper, perhaps?) than my cake blog, because the story didn't appear. I'm hoping it will run next week. When the Daily News sent a photographer to my house last Thursday morning to take some pictures, I decided to bake a cake so there would be something to photograph besides me. 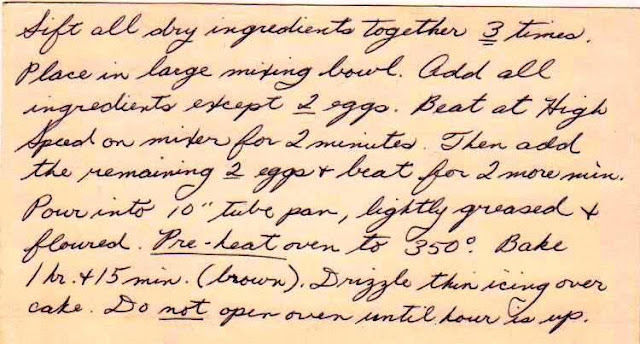 This c. 1945 recipe for pound cake seemed perfect. And it was. I put the batter together in a matter of minutes early in the morning -- it could not have been easier. I popped it in the oven, and even though the recipe author cautions NOT to open the oven door for the first hour, I cheated. And the cake was still fine. We all enjoyed the cake; even the Daily News photographer posed while eating a slice for breakfast. I brought the cake to work that morning but fearing that the co-workers in my department were suffering from cake fatigue, I brought it over to the Abrons Arts Center where one of the artistic types who works there was overheard saying that it was the best pound cake he'd ever had. It would have been lovely plain, but I made a simple confectioner's sugar and milk icing for it. If I'd been slightly more alert that morning, I would have used lemon juice instead of milk; the citrus note would have played well against the creamy vanilla-ness of the cake. And if anyone's wondering what cake I ate on my actual birthday, there were two. Some lovely colleagues brought me cake (and cookies) from Momofuko that were beyond delicious, and at dinner, my daughter's boyfriend had arranged for a truly special raw chocolate cake (with candle!) to be served to me. Believe me, its flavor was wonderful and complex, the perfect ending to a terrific meal. 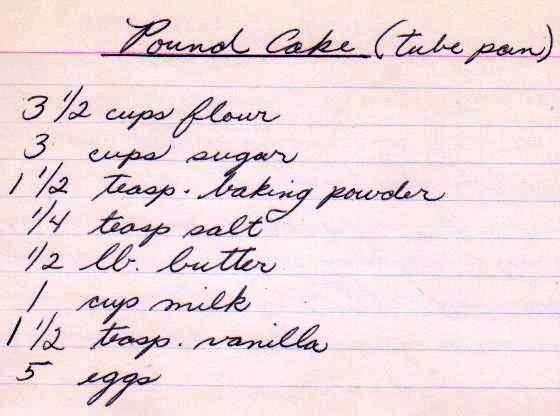 I recall hearing that name pound cake comes from the ingredients being a pound of flour and a pound of sugar or shortening or something - could this be true? 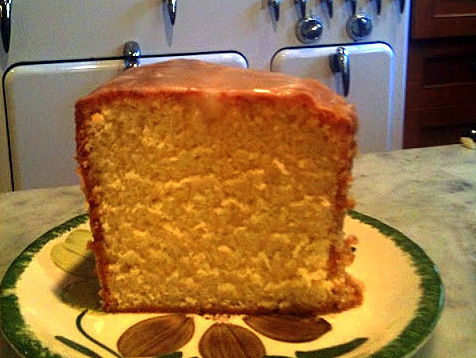 Margaret: Yes, I believe you are correct that pound cake got its name that way. I heard that it was so that the recipe could always be kept in mind (as opposed to on paper). And I have no idea about the "manufacture" of raw chocolate, but I'm sure it is *very* nutritious, just like all chocolate. In fact, isn't it one of the four food groups? Suan: So sorry I couldn't be there to toast you, watch you blow out your candle.. or enjoy some pound cake. But HAPPY BIRTHDAY and many happy returns.. can't wait for the Daily News piece! @Allen: Thanks so much. I just got an email from the Daily News reporter, saying that the story was bumped, but it will run! Hopefully sometime before my NEXT birthday! Wow! Happy Birthday! I love your blog. Not only is it informative and entertaining, it makes me happy. @Kentucky fan: Lovely to hear from you. Thanks so much for writing. Susan, congrats on your blog. This is what America needs tradition and old fashioned goodness. Bless you and your family.